A Southern Front fighter opening ammunition crates at Brigade 52 on Tuesday. Most crates contain 120mm smooth-bore tank ammunition. Others hold miscellaneous RPG rounds. AMMAN: The Southern Front, a Free Syrian Army-affiliated rebel coalition, won tons of mostly tank and other miscellaneous ammunition from what was once the second-largest regime military base in Syria: Brigade 52, located 24km northeast of Daraa city. Aside from tons of plundered kit, the capture of Brigade 52 protects the Southern Front's eastern flank as it inches towards Damascus, while paving the road for a rebel assault on Tha'lah Airbase approximately 8km southeast of Brigade 52. Tha'lah Airbase, once or perhaps still home to the 765th and 766th Mi-25 Hind helicopter gunship squadrons, is the most important regime airbase in As-Suwayda province. As the first Chinese-make missile hit regime artillery at Tha'lah, the Southern Front announced on Wednesday the beginning of the battle to liberate Tha'lah Airbase, a fight to be named "Crush the Tyrant." Fighting at both Brigade 52 and Tha'lah Airbase thus reveal a well-equipped fighting force, fielding a variety of advanced, foreign-sourced weapons. Notably, although the Southern Front pillaged plenty in the way of ammunition at Brigade 52, it seems the regime withdrew most of its heavy war machines, leaving behind slim pickings vehicle-wise: Decrepit transport vehicles, BMP's in the midst of engine heart transplants, a vulnerable, near-antique T-54, one T-72 and a Soviet-design ZSU-23/4 self-propelled anti-aircraft gun. 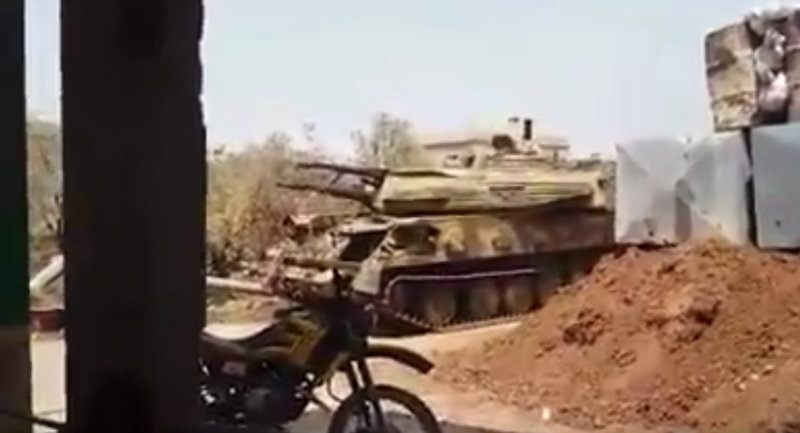 Perhaps the regime is learning to leave less behind in the way of booty, having withdrawn its best tanks, artillery and transport vehicles prior to the fall of Brigade 52. The rebel victory at Brigade 52 was not an FSA-only affair; Ahrar A-Sham, not part of the Southern Front, participated in the battle. On Wednesday, Ahrar released at least two videos revealing its hand during the attack, delivering mortar and artillery support during the battle's early stages. In addition to Islamist Ahrar, which likely took its pound of spoils, Jamaat Bait Al-Maqdis, an IS affiliate, also fought at Brigade 52, capturing and killing soldiers. The fall of Brigade 52 was therefore not only a victory for the mostly moderate Southern Front, but for less appetizing rebel elements as well, regardless of how many reports white wash the battle as a purely moderate affair. Correction: Al-Maqdis is not an IS affiliate. According to a Bait Al-Maqdis statement, the organization "does not follow any ... external group." One of the first videos of the spoils of Brigade 52 show plenty of ammunition crates, but little in the way of vehicles. Slim pickings vehicle-wise, despite the odd T-54, T-72, and ZSU-23. Source: "Spoils of the mujahideen at Liwa 52." 2015. Captured ammunition crates at Brigade 52 stack high. Source: "Spoils of the mujahideen at Liwa 52." 2015. Yet more ammunition crates lie inside Brigade 52. Source: "Mujahideen Haroun." 2015. A second video reveals mostly tank and RPG rounds inside captured crates. Source: "Mujahideen Haroun." 2015. What appears to be a Chinese HJ-8 ATGM in the hands of a Southern Front rebel, reportedly targeting Tha'lah Airbase. Source: "Firqat Al-Magawir targeting a 57mm cannon at Ath-Tha'lah Airbase with a "Red Arrow." 2015.